The CSUSB Associated Students Inc. (ASI) will be hosting a free special event, Sí Se Puede: A Dialogue with Dolores Huerta, on March 7. A civil rights activist known for her work in establishing the National Farm Workers Association alongside Cesar Chavez, Huerta is also the recipient of the United States Presidential Medal of Freedom for her speaking engagements. Dolores Huerta began her career in activism in 1955 with Community Service Organization founder Fred Ross to form the Stockton chapter of the CSO. This grassroots group worked to end segregation, discrimination and police brutality and improve social and economic conditions of farm workers. In 1960, Huerta created the Agricultural Workers Association and eventually co-founded the National Farm Workers Association with Chavez. These two groups combined in 1965 to become the United Farm Workers Organizing Committee, also known as the United Farm Workers. Huerta’s success in legislative processes include securing Aid for Dependent Families and disability insurance for California farm workers in 1963 and the enactment of the Agricultural Labor Relations Act of 1975. This was the first United States law that granted farm workers in California the right to collectively organize and bargain for higher wages and better working conditions for themselves. Huerta’s achievements do not stop there. Additionally, she is a recipient of the United States Presidential Medal of Freedom for civic engagement, the founder of the Dolores Huerta Foundation, and continues to promote policy advocacy in various areas of development. It was decided that Huerta would speak at CSUSB by shown interest from the students on campus. ASI made it a priority to schedule this event as a way to not only fulfill the request of the students, but to also provide an example of someone successfully advocating for social change. “Social justice and advocacy is very important to our board… So when the students came up with the idea for this event, we ran with it,” Interim Executive Director Jesse Felix said. Felix’s position in ASI includes overseeing the kinds of decisions and plans that the student corporation makes to ensure that they get implemented. He believes that those who attend Dolores Huerta’s event will gain beneficial knowledge about what it takes to make a change in the world. 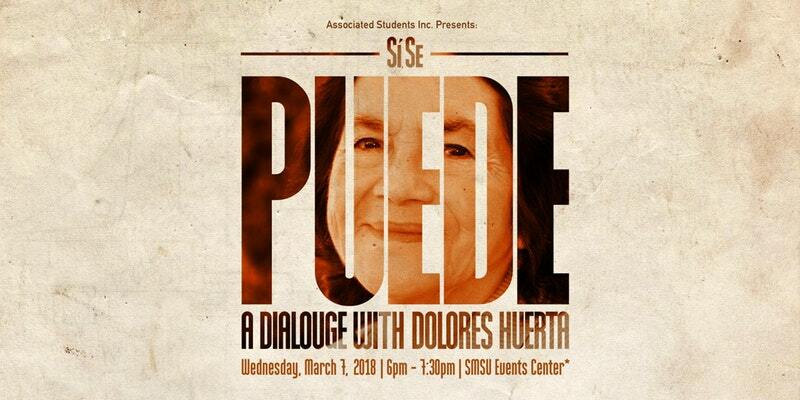 In addition to the Sí Se Puede: A Dialogue with Dolores Huerta event, the documentary “Dolores” will be shown in the Santos Manuel Student Union Theater for two days before the scheduled visit. Showtimes for the film run on March 5 at 9 a.m. and March 6 at 10 a.m. and will continue every two hours. Seating will be on a first-come, first-served basis, but there is no registration required to see the documentary.